The monochrome colouring of material meant that these ivories could ape in miniature the ancient marbles much valued by connoisseurs and collectors of the time. 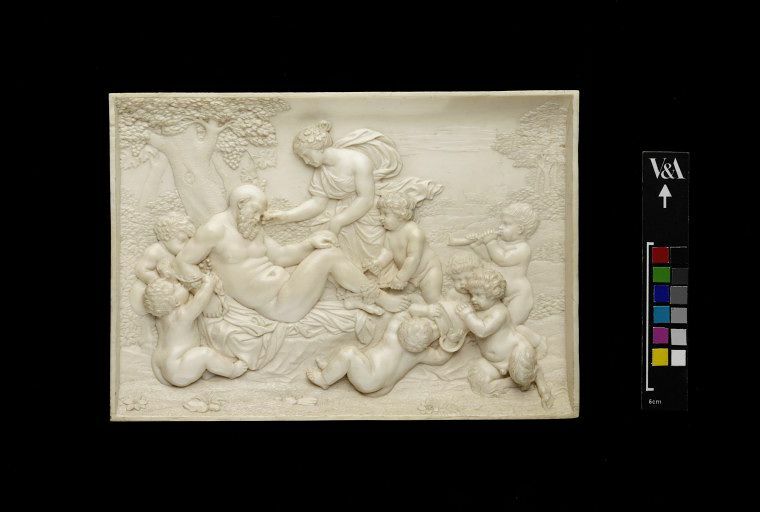 This ivory is made after François du Quesnoy who was a Netherlandish sculptor, who spent most of working life in Rome and assimilated the classical style. 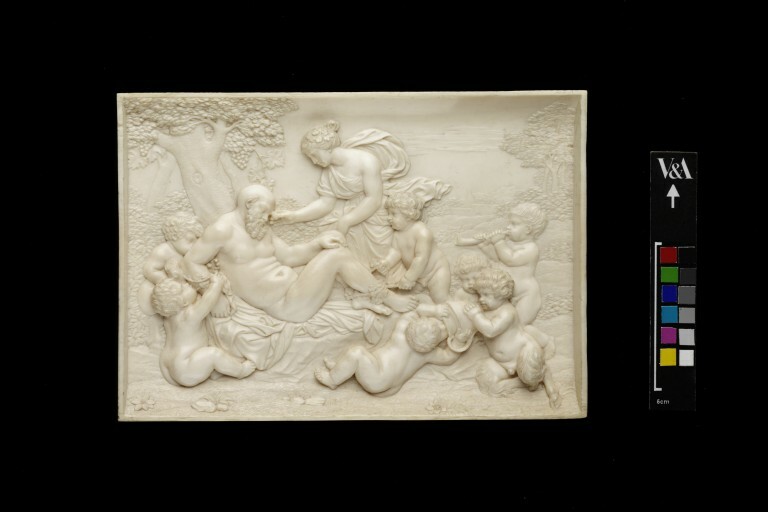 His tender and sensuous reliefs of cupids, satyrs and small children were highly influential. See also inv.nos. 1060 to 1064-1853 for further reliefs in this group. It may have been made soon after his death in the second half of the seventeenth century Boudon-Machuel calls them pasticci, pastiches derived from in part from other compositions which Du Quesnoy executed on a larger scale in marble. Variants are also known in bronze, enamel and porcelain. The nicks on the back of the present reliefs, show that they were differentiated, and must have been made to indicate how they should be displayed at one time. The reliefs vary slightly in size from one another, but fundamentally they form a set, and must have been shown as a group together. Relief depicting a group of seven cupids and child centaurs binding the sleeping Silenus with ivy wreaths while a nymph is painting his brows with the juice of mulberries; fighting and drinking; making wine in a vat. There are trees and a distant cityscape. Two pairs of holes are drilled into the top for fixing purposes. Bought for £26 5s. in 1853 (vendor unrecorded). Perhaps purchased from Benjamin Lewis Vuillamy (1780-1854), clockmaker to the Queen. Possibly formerly in the collection of the Earl of Bessborough, sale Christie's, London, 7 February 1801, lot 30 (sold for £141 15s. 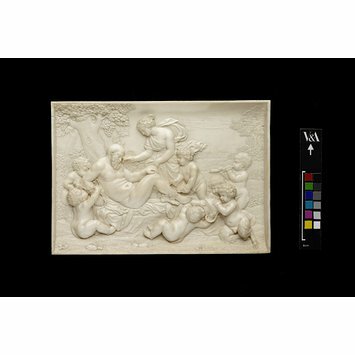 ):'six beautiful Groups of Boys, exquisitely carved in ivory, from nature, by Fiamingo; truly chef d'oevres of this celebrated artist; from the collections of the great Duke of Buckingham. Laurent, M. Quelques oeuvres inédites de François Duquesnoy. Gazette des Beaux-arts. May 1923, pp. 298-300, ill.